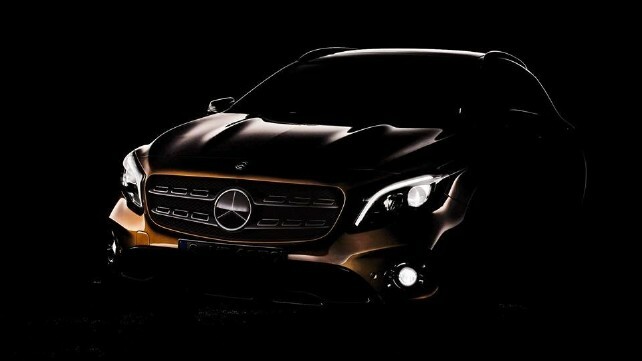 Mercedes-Benz has released a teaser image for a facelifted version of the GLA crossover ahead of its official debut at the 2017 Detroit Auto Show. From the photos we can see that the updates are in line with what we saw on the CLA and A-Class that were launched last year. Updates include a revised fascia with LED headlamps, new avant-garde grille and a sporty bumper to match with the newer image of the car. Also expect some changes to the rear as well as some new designs for the alloy wheels. Changes to the cabin include a free standing eight inch display, Apple Car Play/Android Auto as well as new upholstery options. The GLA in the Indian market is offered with 2.2-litre diesel engine that produces 134bhp/300Nm in the standard models and 168bhp/350Nm in the 4MATIC enabled 220d Activity edition. There is also a top spec 45 AMG model which is powered by a 2.0-litre petrol engine producing 355bhp/450Nm. The standard models get a seven-speed AT while the 45AMG gets AMG tuned seven-speed AT. We can expect this car in the Indian market by the middle of this year and it will be brought here through the route of local assembly which will be done at the German automaker’s plant near Pune. This car takes on the likes of the Volvo V40 Cross Country in the Indian market.